How can reading about something so horrible be this enjoyable? The Iraq of Saddam Hussein may not seem like a probable target for gonzo journalism, but in the hands of British writer/film producer Roberts (Empire of the Soul: Some Journeys in India, 1996, etc.) the match is perfect. The subject matter is situated at the extremes of human existence: the megalomania of Saddam, the cruelty of his lackeys, the depravity of life under a totalitarian dictator, the human suffering from war and embargo are all so deep that description would suggest caricature, even when objective. Such a bizarre reality cannot be presented in banal terms, Roberts seems to assume, so it’s best to take a bizarre approach. He is right. His three trips into Iraq, first in 1990, then during the Gulf War in 1991, and finally in 1995, unveil a progressive deterioration of conditions in that country that is astounding when one considers how bad things were in 1990. Along the way, we laugh at the common foibles—distortions of language, vices, bad decisions—that populate life on a personal level while constantly remaining aware that genuine evil is present. Even though he accidentally took mind-altering drugs just before his interview with Saddam, Roberts cannot obscure the soulless quality of the dictator. 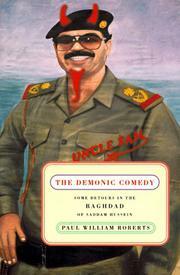 The only new information elicited from Saddam is his favorite movie: The Godfather. Fortunately, Roberts does provide information during occasional serious interludes, offering a good overview of the emergence of the Ba’ath Party as well as a broad perspective on the problems that have plagued the Middle East during this century. No doubt is left about Roberts’s assessment of Saddam, but he is not an apologist for the West, either. The current embargo means that now “we are the ones punishing the innocent, poisoning the wombs of the unborn.” A light book with heavy undertones.